Catherine at Sharp Words has once again asked me to help her to review a book. Okay, that's just a big fat lie. I asked her. I begged her. Last time we did 'The Book Thief' and it was great fun and got a fun reaction. 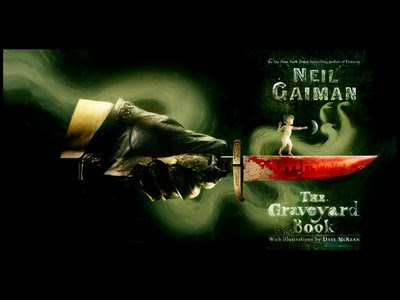 This time it's 'The Graveyard Book' by Neil Gaiman. Click here and read our review. Well, really it's her review with me throwing random stuff in here and there. You know how I go on. Nice review. I think I'll check out the book. But Ken, not one reference to Stardust? sniff. sniff. Great way to review a book. And it sounds like a great book, too, so... job well done everybody. I left my comment over there, and loved your one-on-one review; great fun! Awww, don't do yourself down, Ken. Your input was completely valid and not as long-winded as I can be sometimes. Fiendish: I think you'd enjoy it.